Who is the most quoted living American in the latest edition of Bartlett’s Famous Quotations? It’s not a president, an actor, an author, or some titan of industry. It’s not even a highly regarded academic, scientist, nor philosopher. It’s a long-retired baseball player. 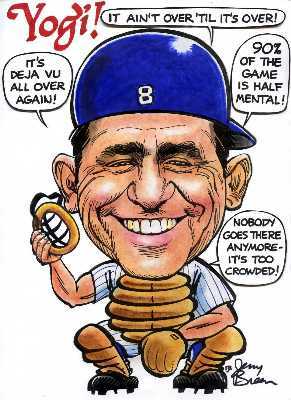 Of course, it’s Yogi Berra. There is even a sub genre within the world of quotations known as “Yogi-isms.” Yogi himself tries to brush off all the hoopla around his legendary, oft-quoted, comments by saying, “I never said the things I said.” Which of course is another Yogi-ism, itself. Yogi, while playing with the Yankees, won three MVP awards, one of only four players in history to do so. From 1949 to 1955, playing on a team that included Joe DiMaggio and Mickey Mantle, he led the Yankees in RBIs for seven consecutive seasons. His ten World Series rings is more than any other player in history. And as a manager, after retiring as a player, led teams in both leagues to World Series appearances, one of only six men to ever do so. According to many baseball experts, Berra was the greatest catcher of all time, and detailed analysis of baseball statistics places Yogi as the 52nd greatest non-pitcher in major league history. Enough about Yogi. Below are some of my favorite Yogi-isms. While they all make you smile, some may even make you think. Yogi may be a master philosopher after all. “It’s like déjà vu all over again”. “He must have made that before he died.” — Referring to a Steve McQueen movie. “I’d find the fellow who lost it, and, if he was poor, I’d return it.” — When asked what he would do if he found a million dollars. “It gets late early out there.” — Referring to the bad sun conditions in left field at the stadium. “I’d say he’s done more than that.” — When asked if first baseman Don Mattingly had exceeded expectations for the current season. “We have a good time together, even when we’re not together.” – referring to his wife. “I want to thank you for making this day necessary.” — On Yogi Berra Appreciation Day in St. Louis in 1947. “No, ma’am, it’s not even carbonated.” (Yogi’s answer when asked if the word Yoo-Hoo was hyphenated.